Metropolitan Gabriel was born May 18, 1730 in Moscow in the family of the Synodal subdeacon, who later became a priest. In 1753, P. Petrov graduated from the Moscow Slavic-Greek-Latin Spiritual Academy, then in 1754 he was appointed a printer of the Moscow Synodal Printing House, in 1757 – a teacher of the Slavic-Greek-Latin Spiritual Academy, in 1758, teacher of rhetoric of the Lavra Troitskoy Theological Seminary. June 28, 1758 PP Petrov became a monk Gabriel and soon – hierodeacon and hieromonk. In the autumn of 1758, Hieromonk Gabriel was elevated to the rank of archimandrite and appointed rector of the Holy Trinity Seminary and governor of the Trinity-St. Sergius Lavra. August 8, 1761 Archimandrite Gavriil was appointed rector of the Moscow Slavic-Greek-Latin Spiritual Academy and rector of the Zaikonospassky Monastery. 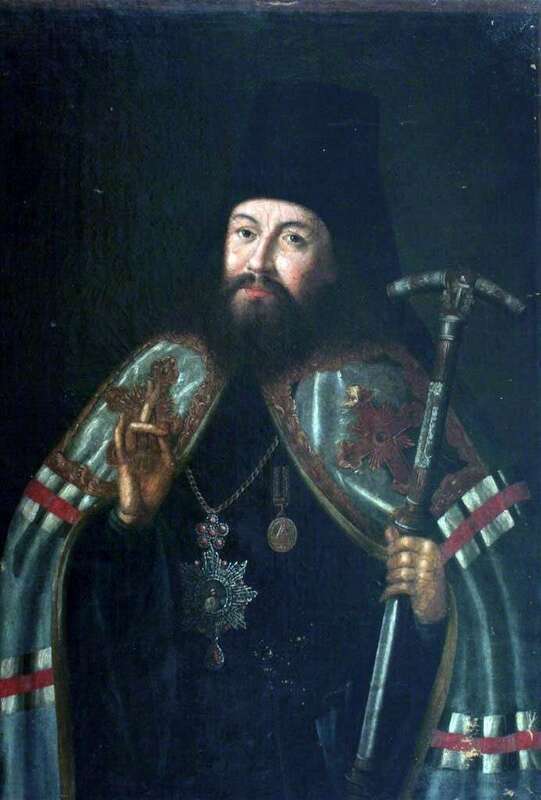 December 6, 1763 Archimandrite Gabriel was elevated to the rank of bishop of Tver. In 1765 Bishop Gabriel was appointed a member of the commission for drafting the Charter of the New Code, September 27, 1769 – a member of the Holy Synod. On September 2, 1770, His Grace Gabriel became Archbishop of St. Petersburg and Revel and the Archimandrite of the Alexander Nevsky Lavra, January 1, 1775, Archbishop of Novgorod and St. Petersburg, September 22, 1783, Metropolitan, on October 21, 1783. – an active member of the Russian Academy. On December 16, 1799, His Eminence Gabriel was appointed Metropolitan of Novgorod and Olonets. Since December 20, 1800, Metropolitan Gabriel was resting, living until his death at the Novgorod Bishops’ House. Metropolitan Gabriel at various times received high church and civil awards. Starting from the end of 1776, Metropolitan Gabriel took an active part in the life and work of the Russian Academy of Sciences, occupying for a time even the posts of the Vice-President and President of the Academy of Sciences. On behalf of the Academy of Sciences, Metropolitan Gabriel was chairman of the Academic Commission for the compilation of a dictionary of the Russian language. In addition, Metropolitan Gabriel is also known as a major scholar theologian, philosopher, church historian, archaeologist, philologist and “Discoverer of the monuments of ancient Russian literature.” Honored member of the Academy of Sciences was elected on December 29, 1776. Description and meaning of the painting Portrait of Archbishop Gabriel Petrov by Alexei Antropov.